Meeting of Baden-Powell and Mahon. Drawing by H.C. Seppings Wright. The days passed quietly after Sarel Eloff’s ill-fated attack on the town. 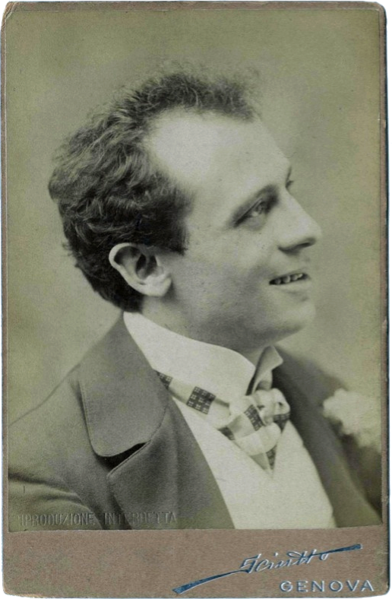 The young man of bravado paced back and forth in his cell at the town jail, wearing slippers, riding breeches, and a tight-fitting brown jersey that showed off “the physical development of his shoulders,” Times correspondent Angus Hamilton observed. * Eloff had an air of romance that reminded Hamilton of a hero in an Anthony Hope novel—the Ruritania books that were so popular then. On May 16 news came that the columns of Colonel Bryan Mahon and Colonel Herbert Plumer had joined forces at Masibi Stadt, just 20 miles to the west. Baden-Powell and members of his staff climbed up to a perch that had been constructed atop a railway shed. In town all remained calm. 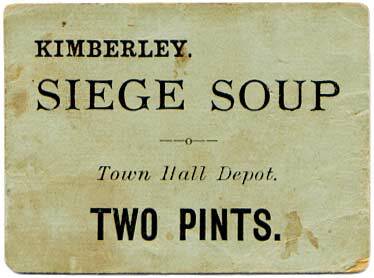 The final in the siege billiard tournament was being played at the club, and Africans were skinning a horse for the soup kitchen. Suddenly B-P sprang into action, ordering the Bechuanaland Rifles and Protectorate Regiment to move out promptly to intercept a party of Boers seen crossing the veld in the vicinity of the relief column. Town residents scrambled onto the roofs and peered toward the dust-blurred horizon. 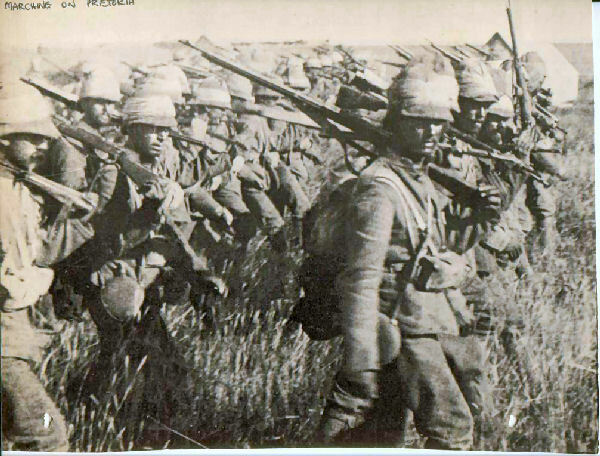 Bursting shells marked an encounter with the Boers, but the action subsided and the troops came on toward town. At dinnertime, the first of the relieving force arrived, nine troopers who’d dashed ahead in their eagerness to reach the town. They belonged to the Imperial Light Horse, part of Mahon’s column, which had originated at Kimberley. The bulk of the relieving force arrived in the small hours of the night. The townspeople left their beds to flock out to the polo-ground, where they watched the procession come into camp. Under a brilliant moon rolled in endless lines of horses, mules, and oxen with their wagons and their guns, dark shapes casting eerie shadows. The troopers started campfires, and the townspeople wandered about, engaging them in conversation and thumping them on the back in congratulation. But the weary troopers cast themselves on the ground to catch a few hours’ sleep, and the townspeople reluctantly returned to their homes. None in town could sleep, and by 4:00 they were all visiting each other, chattering and joking. Within 30 minutes the Boers had evacuated their camp and moved off hastily with their trek wagons. 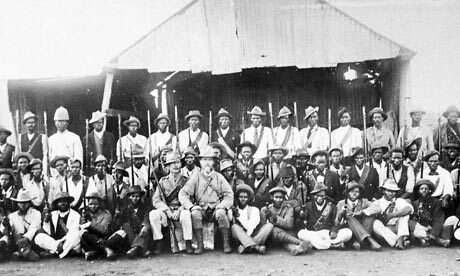 Residents of Mafeking—townspeople, soldiers of the garrison, Africans from the Stadt—swarmed out to Game Tree Fort and the house that had been occupied by General Snyman. Curiosity seekers and looters alike reveled in all left behind: food of every kind, whiskey and dop, tobacco, sporting rifles and ammunition, clothing, letters and telegrams. Africans staggered off under huge bundles of food, eating as they walked, for they had been severely deprived. Col. Bryan Mahon, center (no hat), and staff. 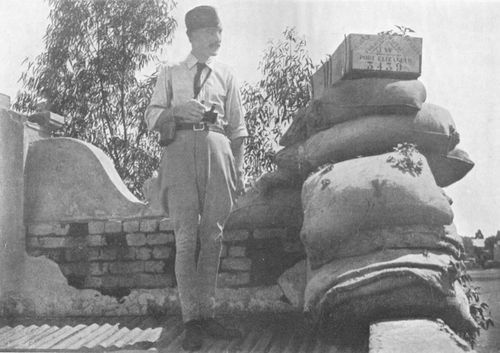 Journalist Filson Young, “embedded” with Mahon’s flying column, described a Relief Dinner held for Mahon and his staff. ** A souvenir menu, autographed by all who attended, listed items such as oyster patties, roast duck, and strawberry tartlets, washed down with Leoville 1887. The bulk of these items must have been brought from Kimberley. Toasts were made to the Queen and the Royal Family. If a dinner was held for the staff of Colonel Plumer, no journalist was present to record the event. The situation differed substantially for the two columns that merged only at the very end. Mahon had pulled off the feat of traveling 240 miles in 12 days across dry stony veld. But Plumer and his Rhodesian Regiment had been in the vicinity since early March, using Gaberones as a base and making several attempts to reach Mafeking from the north. 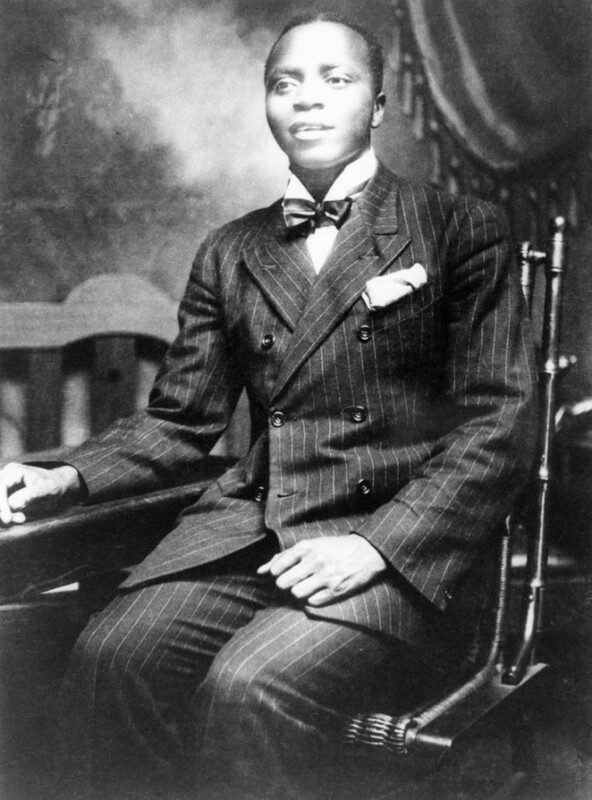 On March 31 Plumer had ventured within a day’s march but met with strong resistance near Ramathlabama. Casualties amounted to 12 killed and 26 wounded, including Plumer himself. He had only 350 men—he needed reinforcements. 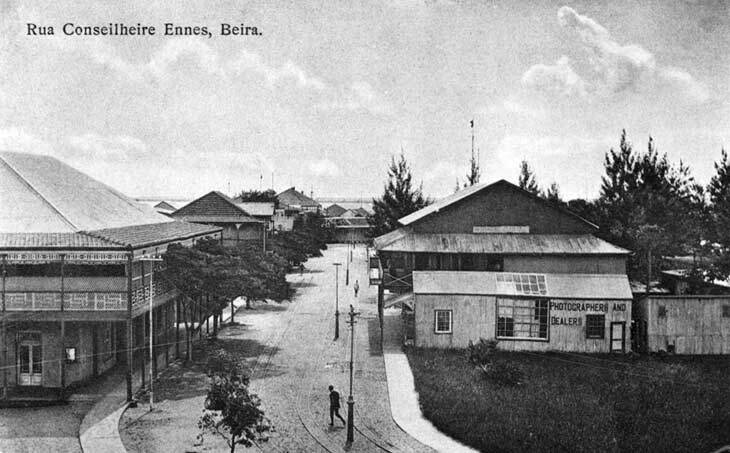 Beira, Portuguese East Africa, 1905. Canadians and Australians came to Plumer’s aid by a very roundabout route. 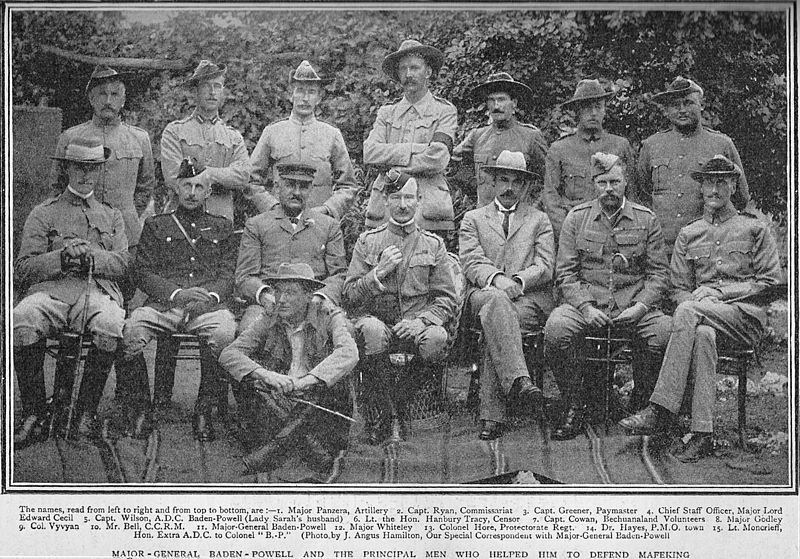 The “C” Battery of the Canadian Artillery sailed on the “Columbian” to Cape Town, and after two weeks camped at Stellenbosch received orders to reboard and proceed to Beira in what is now Mozambique. 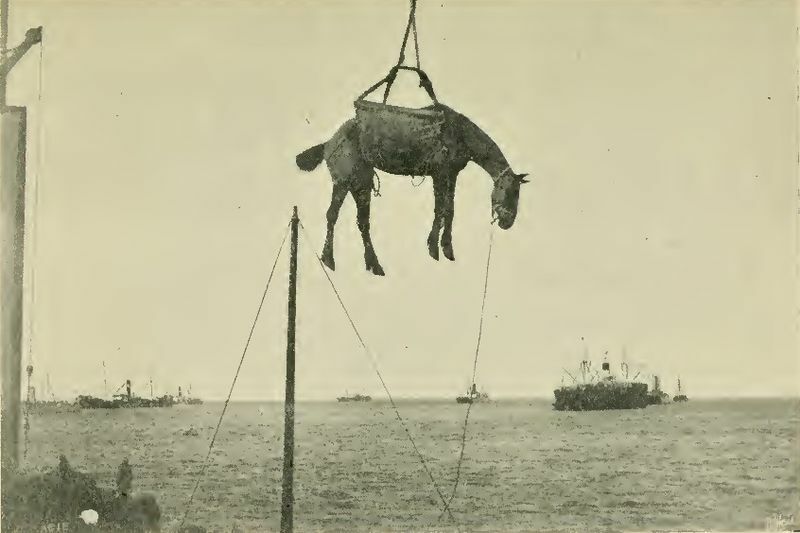 Meanwhile, the transport steamer “Maplemore” had sailed from West Australia to Cape Town carrying the Queensland brigade (three regiments) and hundreds of horses and mules. Immediately upon arrival they were instructed to go on another 1,700 miles to Beira. 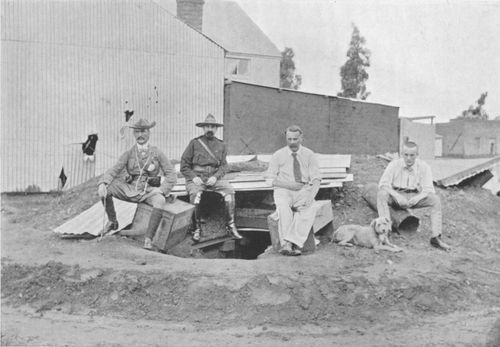 Veterinary-Lieutenant Burns described the journey for the Adelaide Advertiser. He didn’t have anything good to say about Beira: “The whole place is most unhealthy, being a swamp for about 50 miles inland, and white men cannot live there and be happy.” Men and horses traveled via a 2-ft. gauge railway to a place in the jungle called Bamboo Creek (Vila Machado), where they had to transfer to a 3-ft. 6-inch gauge line. This cumbersome process ended up taking two weeks, “in a melting hot sun and in a tropical atmosphere like a Turkish bath,” as Burns described it. Mortality ran high among the horses and mules: about 500 of them died there from the African horse sickness. Burns said, “One got sick of seeing the niggers continually dragging away dead animals. The work got too much for them, so we had some trucks with an engine night and morning to take away the animals that died in the interval.” In the meantime the men wandered about in the bush shooting big game. Somehow Mahon’s men got more of the glory. 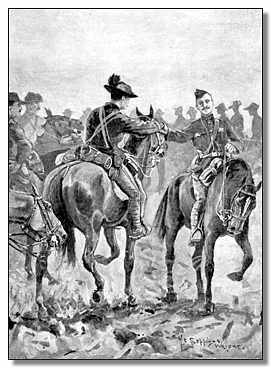 That column comprised the Imperial Light Horse, mainly Johannesburg Uitlanders; the colonials of the Kimberley Mounted Corps; the Royal Horse Artillery; and 100 infantry specially picked to symbolize the Imperial homeland: 25 each from England, Scotland, Wales, and Ireland. When some of Mahon’s column pressed ahead to reach Mafeking first, Plumer’s men were said to have groused about it. Yes, it was true Mahon’s flying column had covered a remarkable amount of ground in a short time, but the Rhodesians had suffered casualties, while the Queenslanders and Canadians had made that godawful journey. 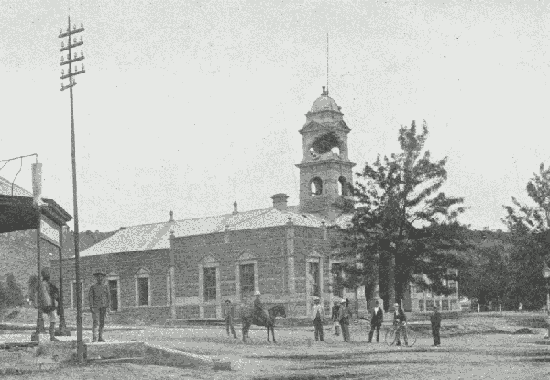 Plumer’s column left town May 19 and soon saw action in the eastern Transvaal. Plumer himself stayed in the field throughout the war, chasing Christiaan De Wet across the veld in the harrowing days of guerilla warfare. Like many of the top British officers, both Plumer and Mahon went on to serve in WWI. Plumer commanded the 2nd Army and won a famous victory at Messines. 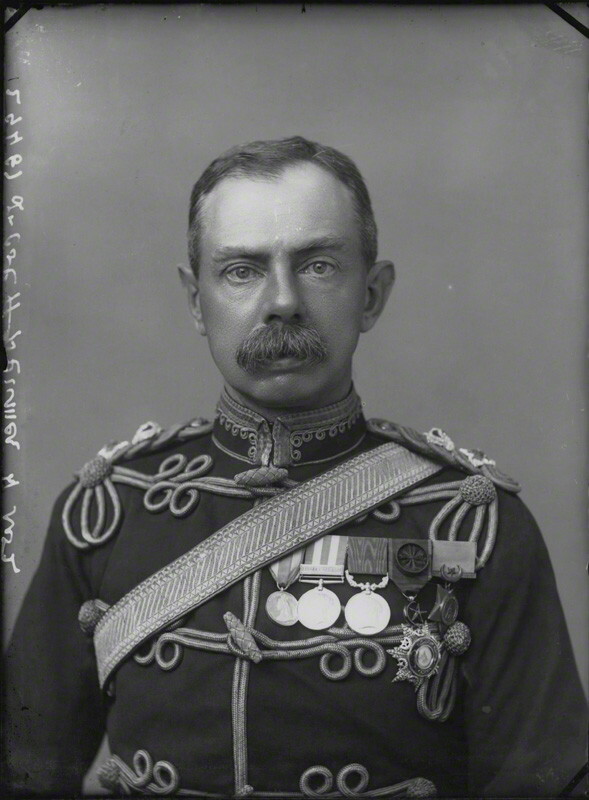 Mahon commanded forces at Gallipoli and served in the Mesopotamia Campaign before being appointed Commander-in-Chief of British troops in Ireland, dealing with the Irish republicans. * Angus Hamilton, The Siege of Mafeking. London: Methuen & Co., 1900. 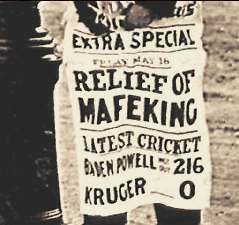 ** Filson Young, The Relief of Mafeking: How It Was Accomplished by Mahon’s Flying Column. London: Methuen & Co., 1900. 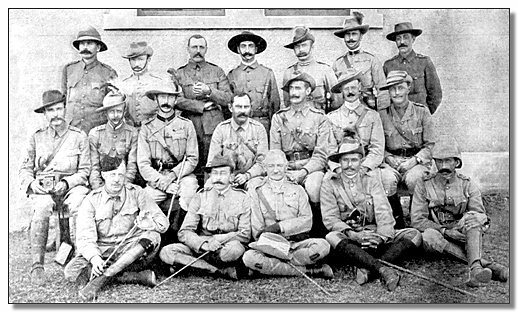 ## Arthur Conan Doyle, The Great Boer War. London: Thomas Nelson & Sons, 1900 and 1902.